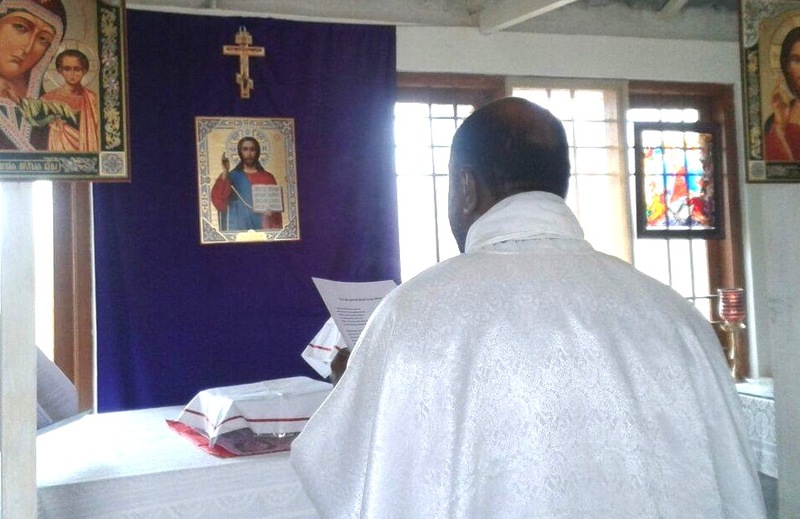 The new Western Rite Parish of Saint John Chrysostom in Bangalore, India is served by Fr. Silouan Benedict. The SAINT COLMAN PRAYER BOOK is about to be published, hopefully on sale online by end of May. The ALTAR BOOK version containing just the Liturgy and some additions will follow very soon. The three volume Proprium-Lectionary will follow as soon as possible thereafter. 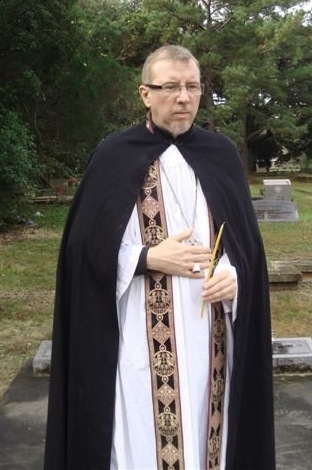 Fr John Vieages was tonsured as Hieromonk Ezekiel, Fr Cyprian Craig was made Priest and Aristibule Adams was made Sub Deacon at Saint Nicholas Monastery Fort Myers by His Eminence Metropolitan Hilarion. The ROCOR Synod announced that Bishop George (Schaeffer) (Chairman of the Commission on Western Rite) is to be appointed as Bishop of Canberra. Metropolitan Hilarion gave his blessing to the Hermitage of Saint Bride website. Fr Michael returned to the United Kingdom from his trip around the world. 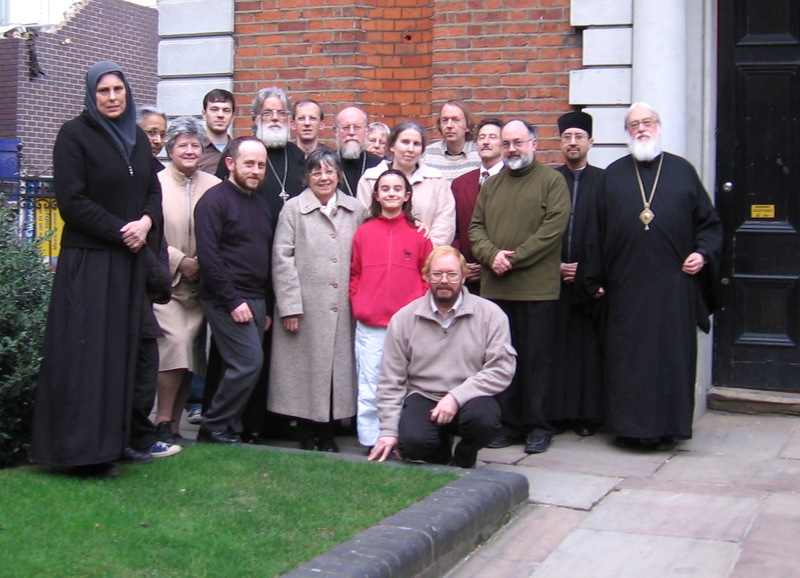 Fr Michael spent several days staying in the Metropolitan’s house with him in Croydon, discussing the situation in the United Kingdom. Metropolitan Hilarion formally blessed in writing the Saint Bride Hermitage in Edinburgh, Scotland, the first Orthodox monastic institution in Mainland Scotland for a thousand years. The Hermitage is blessed to use the ancient British Western Rite Liturgy of Saint John the Divine. To censure Bishop Jerome for his willfulness in administering the parishes adhering to the Western Rite, and in performing various ecclesial services not approved by the Synod of Bishops, and for criticizing his brethren in letters to clergy and laity. To deny recognition of the ordination of a group of individuals by Bishop Jerome during a single divine service, and to regularize them following a thorough examination of the candidates. 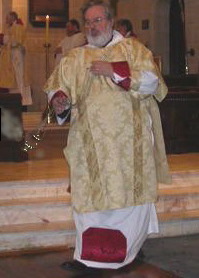 To release Bishop Jerome from all duties, including those of Vicar of the President in administering Western Rite parishes, designating him as retired without the right to serve in the Synodal Cathedral of the Sign in New York, or to perform ordinations or award clergymen, and designating his place of residence at St Vladimir Memorial Church of the 1000th Anniversary of the Baptism of Russia in Jackson, NJ. To bless Bishop Jerome to perform divine services within the confines of the Eastern American Diocese with the consent of its Ruling Bishop. To release Monk Anthony (Bondi) from all of his administrative duties and from the spiritual ministry to the Vicariate of Western Rite Parishes. The Synod established a Western Rite Commission headed by Bishop George (Schaeffer). Christminster monastery moved from its home in Hamilton Ontario to its new home in Niagra, New York. Saint Petroc Monastery is closed due to Fr Michael taking up residence in Scotland. In accordance with Metropolitan Hilarion’s 2011 blessing to start a Hermitage in Scotland. British Prime Minister David Cameron has said the UK is a Christian country “and we should not be afraid to say so”. The Synod has decreed that there shall henceforth be a ROCOR Western Rite Vicariate under the oversight of Bishop Jerome. The ROCOR mission of Saint Eanswythe has been given the use of what is now the Saint Eanswythe Chapel with in the large (formerly Anglican) Antiochian church of Saint Dunstan in Poole, Dorset. Services in the Chapel on a Sunday begin at 09.45. 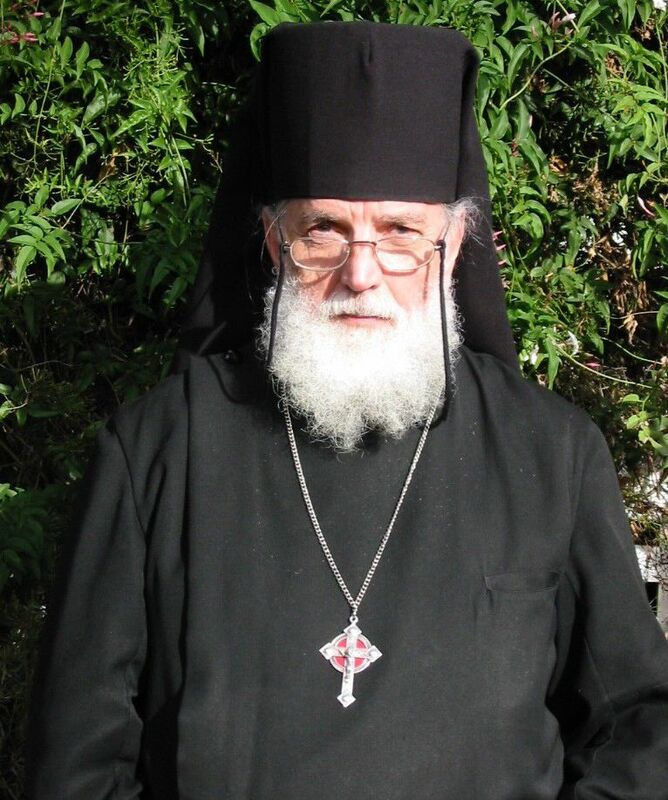 Bishop Jerome will visit Christminster Monastery in Canada on the weekend of May the 29th, where with Archbishop Hilarion’s blessing he will perform an Ordination. His Eminence, Archbishop Hilarion gave his approval to the formation of a Hermitage in Scotland. The Hermitage will be set up by Fr. Michael. February 27th 2011. Fr. Michael, Assistant to the Archbishop for the UK, Blessed Sr Margaret into the novitiate at Saint Eanswythe mission in Christchurch. Sr. Margaret resides at the Life Giving Spring Hermitage in Scotland. February 11th 2011. His grace Bishop Jerome blessed the launching of this website for use by all Western Rite people around the world. The site will be an active site with all pages subject to frequent update and change. Other pages will be added and content will increase as time goes on. 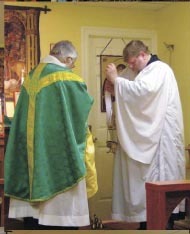 January 1st 2011: Anglicans in America interested in joining the Orthodox Church as Western Riters may also contact Bishop Jerome at vrevjrs (at) execpc.com if they wish. 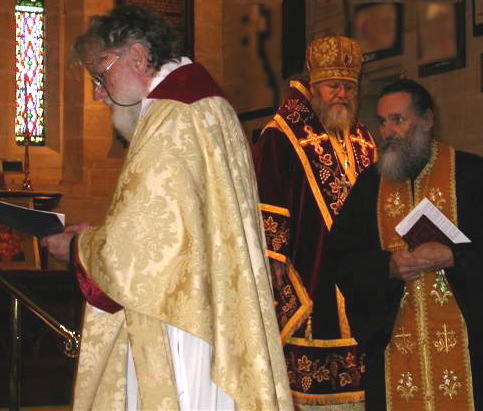 Metropolitan Hilarion issued a Decree naming Fr James (Deschene) as his assistant for Western Rite in North America and Fr Michael (Wood) as his assistant for Western Rite in Australia and the United Kingdom. 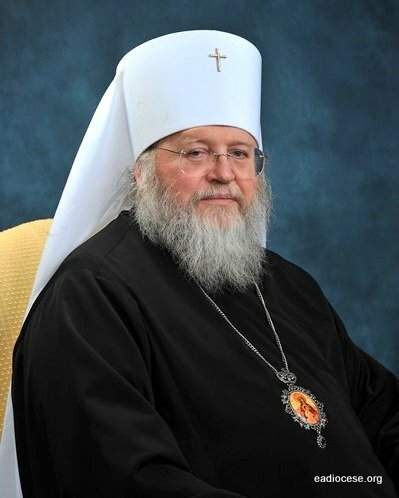 His Eminence, Metropolitan Hilarion, Primate of ROCOR has issued a proclamation, naming Fr. David (Pierce) of Holyrood Hermitage as Abbot of the Monastery of the Holy Dormition of Our Lady of Mount Royal. The proclamation names Abbot Augustine (Whitfield) as the Abbot Emeritus. Abbot Augustine remains in hospital under ongoing care. Mount Royal was originally received into Orthodoxy in 1962 by Bishop Dositheus. Fr. Michael of Saint Petroc Monastery announced today that a new, cheap edition of the Shorter Saint Colman Prayer Book is available. This is a stapled, 105 page edition which retails for $US18.00. It includes an introduction by His Eminence, Metropolitan Hilarion of ROCOR and omits the entire cycle of Holy Week services. Saint John the Baptist Mission in Lewistown. 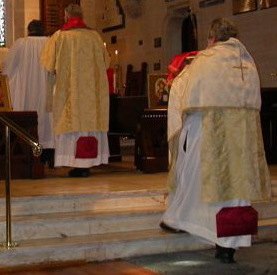 Maryland, formerly Methodist, and then Charismatic Episcopal has become an Orthodox Western Rite parish. Muleshoe, Texas. Saint Clement’s, a small parish of forty-one people and their priest, formerly Charismatic Episcopal were received by Chrismation by Fr. Michael Keiser on behalf of Bishop Basil. After Divine Liturgy, Father Michael blessed icons for members of the ROCOR Saint Eanswythe congregation. Afterwards the congregation had lunch together. Fr. Michael with some members of the congregation who had their new icons blessed. London. Fr. Michael and members of ROCORs Saint Eanswythe Society attended a weekend series of lectures given by Fr. Andrew Louth at Saint Botulph’s Orthodox church in London. The Lectures were on the Orthodox attitude to Saint Augustine of Hippo. Fr. Andrew, an Orthodox Priest, is Professor of Byzantine and Orthodox studies at Durham University. He was joined in the lectures by Bishop Kallistos (Ware) of Oxford. The lectures ran through the Saturday and Sunday. 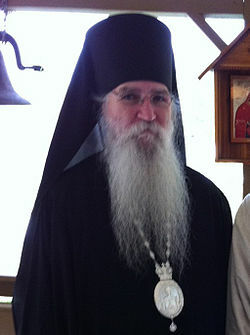 His Eminence, Metropolitan Hilarion, the Primate of the Russian Orthodox Church Outside of Russia, visited Holyrood Hermitage at Avondale (a Western Rite monastic house within ROCOR). His Eminence had talks with Fr. David and Fr. Augustine before blessing the chapel at Holyrood House. Holyrood has been affiliated with Saint Petroc Monastery since 2006. Fr. Augustine was received as a Western Rite monk into Russian Orthodoxy in 1962. Having obtained episcopal blessing, Fr. 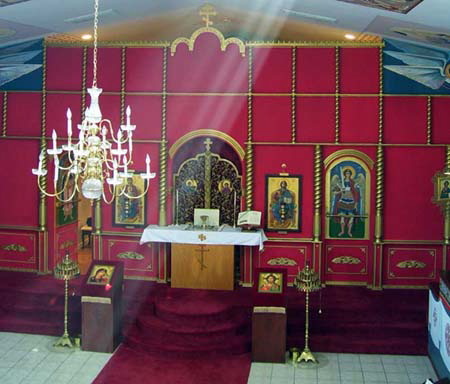 James, the Superior of Christ the Saviour Monastery (ROCOR) is preparing to move the monastery to Hamilton, Ontario. In July, Fr. James visited Hamilton and celebrated the Divine Liturgy of the Western Rite at Our Lady of Glastonbury Oratory, which will be the new home of the monastery after the move. 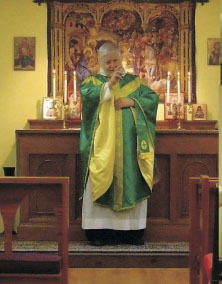 Saint Benedict’s (ROCOR) Parish in Oklahoma City has been officially using the Western Rite since Bishop Peter of Cleveland blessed the Rector, Fr. Anthony Nelson, to to do so in 2006. Saint Benedict’s church Oklahoma City. 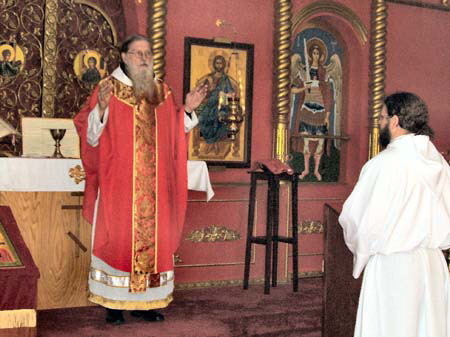 Archpriest Anthony Nelson celebrating the Western Rite. His Eminence Archbishop Hilarion, Chief Deputy President of the Synod of Bishops of ROCOR, pontificated at a solemn celebration of the Western Rite Divine Liturgy to mark the centenary of the decision of the Holy Synod of Russia to authorise the adaption of services taken from the Book of Common Prayer for use by Orthodox people. The day began with the Liturgical Reception of the Archbishop in the Nave of Saint Mary-the-Virgin church. Archbishop Hilarion was accompanied by his Chaplain, Fr. Seraphim Scheidler. Matins was sung by Fr. Michael and Fr. Barry and the choir while the Archbishop vested assisted by Fr. Dcn John. This was followed by the Divine Liturgy. The celebrant of the Solemn Liturgy was Fr. Michael, Superior of Saint Petroc Monastery, Cascades. The Deacon was Fr. 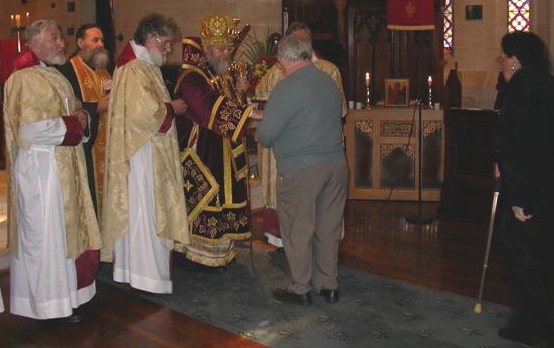 Barry Jefferies, of Saint Stephen Monastery Mission, Launceston and the Sub Deacon was Fr. Dcn. John Whiteside of the Antiochian Orthodox Good Shepherd Mission, Clayton. 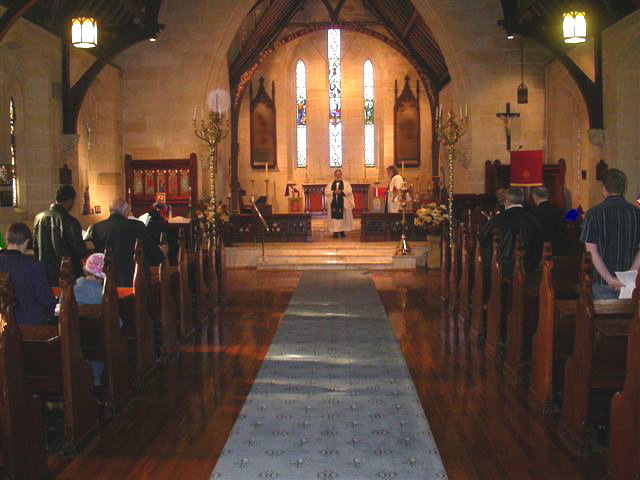 The Clerk for the Liturgy was Dr. John Ward of Saint Dyfan Monastery Mission, Hobart. The Deacon brought the Sacrifice from the Lady Chapel in the Offertory Procession. Fr. Michael read the Last Gospel in the course of the Recession. 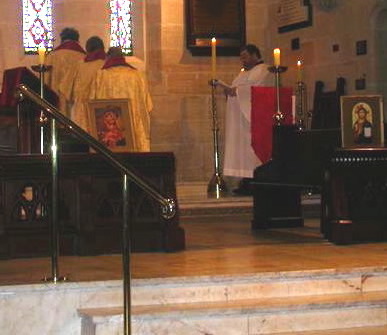 The ceremonial for the “English Liturgy” is Sarum, taken from the ROCOR Saint Colman Prayer Book. The singing was led by Sub Deacon Peter Ball of Saint Dyfan Mission and he was assisted by Anastasia Baines of Saint Dyfan Mission. At the end of the Liturgy, Archbishop Hilarion, assisted by Fr. Barry, distributed the Eulogion to the congregation. The Archbishop, clergy and some members of the congregation then went to lunch at a nearby seaside restaurant.